The Gentleman Crafter: Guest Designer Today! 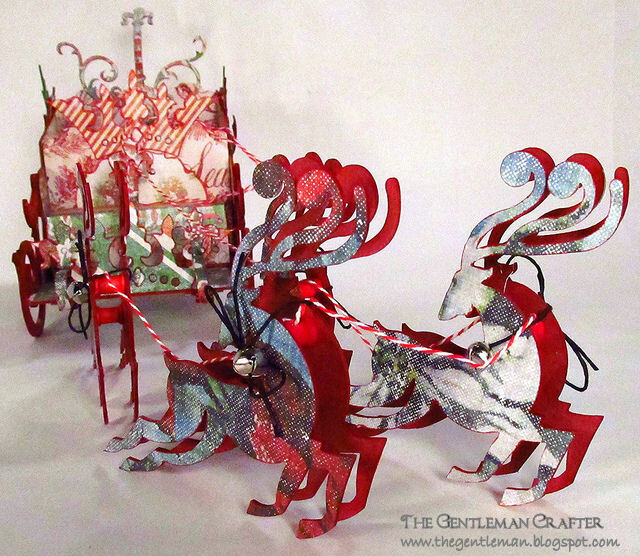 Sizzix- Filigree Reindeer Sleigh! Guest Designer Today! Sizzix- Filigree Reindeer Sleigh! I would be grateful if you would please join me over at Sizzix Blog today as I am the Guest Designer. I have come up with a Christmas project using a cool mixture of Sizzix awesome dies to make a Filigree Reindeer Sleigh and Tim Holtz's new Seasonal Idea-ology Paper Stash- Holiday Past! It was a really fun project to create. I have also done a tutorial that you can find on Sizzix Blog and download in a pdf format. So please go on over and let me know what you think! Thank You Tammy Tutterow for asking me to be a part of Sizzix Bog today! You Rock! Jim, you rock! I love that you take ordinary materials and take it up a notch. This is awesome. Mind blown! Thanks Sweet Sharon! I appreciate you! Betty! Again I thank you! Wow Jim that is really awesome! I am new to your blog and YouTube and I'm so glad I found you! Not only are you extremely talented but I get a little glimps of home when I read your blog. Lived in Austin for most of my life and I sure miss it! 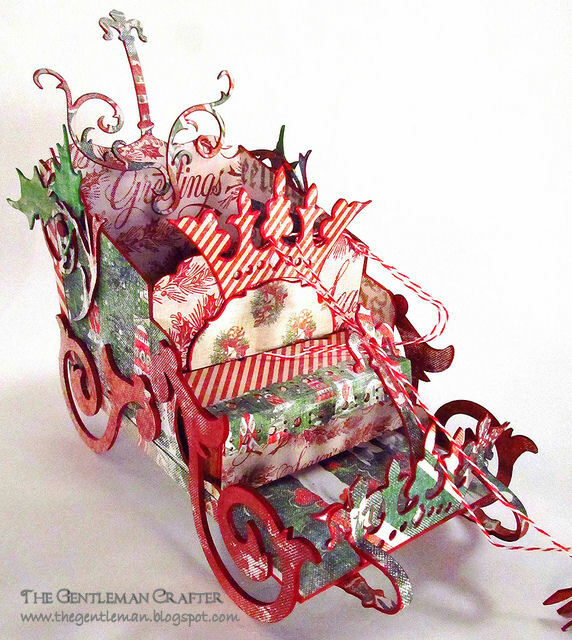 This sleigh is really beautiful, thanks for sharing it! Anytime I can give you a glimpse of home, it would be my pleasure. I moved away once and know how much I missed it! Sure is growing! Actually going to get my "fix" this coming week. Gonna get to see my new Grandbaby and go to Archivers! What could be better? Haha! Where I live now I have to drive 2 hours just to get to a Hobby Lobby and this state (New Mexico) doesn't even know what Michaels is! Can you imagine? Haha! You gotta be feeling my pain. Lol! Merry Merry Back to ya Crafty! Thank you my friend! Now we're talking! I was waiting to see your dimensional creations for the holidays!! You've outdone yourself on this one. Love It. Get ready for more Susan! LOL! Thanks you so much! Yay! I'm glad you liked it June-Marie! Thanks for coming by today! I appreciate you! I love your beautiful sleigh, but cracked up at your misuse of "apart". I'm sure you meant "a part". Totally different meaning when using "apart". You still rock Jim! LOL! Shirley! Fixed! Thanks! Beware, I do this a lot! Absolutely fabulous! It is a joy to see your creative mind at work. I think I have most of those dies, and just might attempt to make this. You are so kind to share it. Thanks Holly! Even if you don't have the dies, look at what you have and you will be surprised how you can incorporate them into the project and make them functional! LOVE LOVE LOVE this! I was blown away by all that is going on here. It was fun to pick out what dies you used. I have been a Sizzix fan since day one and have stuck by their side through good & bad. You are the person they need to show how to go out of the box with their dies. Oh Thanks Lori! I appreciate it! So absolutely beauuuuuuutiful!! What an inspiration!! Love your work, you are such an inspiration to all of us. Thank you for sharing. Wow Jim, this is fabulous. I think I have enough sizzix dies (not the same ones maybe) but I don't have the stag. What an enabler hahaha Thanks for sharing the tutorial. What paper did you use? This is truly amazing and what a mind you have! Thank you for sharing your incredible talents with us! I just became a follower and certainly will visit often! How cool that you are also a dog lover, among other pets! Have a great day! WOW!!!! Jim you rock!!!! Could never imagine something like this!!! it's beginning to look alot like Christmas!!! Love your sleigh....Santa will be so pleased....he will surely leave something special in your stocking!!!! Oh my gosh Jim! You've done it again - taken it out of the box and made it dimensional as well as gorgeous. Your creations are so incredible! So much creative talent that is SO inspiring, and how generously you share your ideas is heartwarming! Bless your heart! Thank you so much for sharing your reindeer sleigh tutorial with all of us. Quite the spirit of this season! What do I think? I think your project is absolutely awesome!!! Ha Ha Ha, couldn't resist. Love your awesome Christmas creation! As amazing as your projects are, I truly believe this one is amazingly awesome. This is by far my most favorite of your projects. Thank you for sharing this. Jim.... You've out done yourself again. Fantastic Work!!! Karen. Jim, this project really started my Christmas juices flowing! I love the engineering you do for your designs, but your artistic talent far outshines even the craftsmanship! As always, your instructions in the tutorial are easy to follow (or I'm beginning to think more like you!) Thanks for taking the time to write up how you made this wonderful creation and sharing it with all of us. Have a great Thanksgiving. I'm going to give your table place cards a go as soon as I post this. Do you ever sleep? Silly question, of course you do, how else would you 'dream up' these wonderful creations? So much work has gone into this, truly inspirational! Fantastic as always. I especially admire your 3d creations. I often have trouble with the paper lifting from the chipboard, and if I try to seal it with something like modge podge then the finish is streaky. How do you do it? What glue/adhesive do you use? I would really appreciate your advice - I have a lot of Christmas projects that I keep putting off because I cannot get the finish I want. Great sleigh! Love how everything just seems to come together so perfectly. thanks as always for sharing. Too cute ...I can tell you had fun !! This is wonderful and would make a great table centrepiece on Christmas Day. You are so clever to think up things like this and very kind to share the instructions with us all too. Thank you! Hello Jim, thank you for the pattern, I had left a comment on the pattern site yesterday. I made one last night - here is my rendition! Thanks so much and have a great holiday!